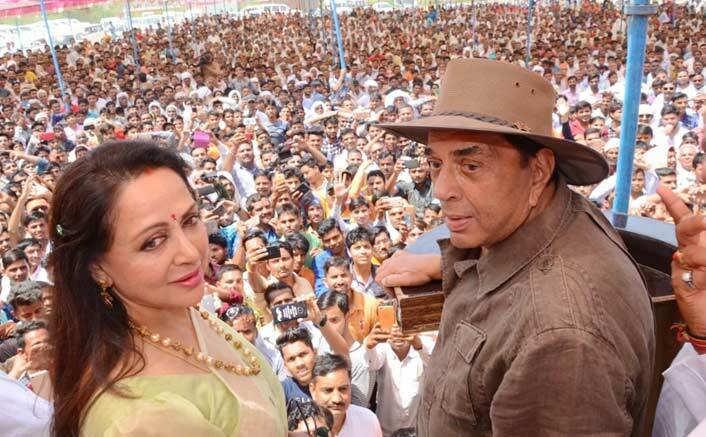 Lok Sabha Election 2019: Popular film actor Dharmendra on Sunday repeated his famous dialogues from the Hindi blockbuster Sholay*as he campaigned here for his wife Hema Malini in the Lok Sabha elections.The still charismatic Dharmendra appealed to voters to ensure the Bhartiya Janata Party candidate’s victory. Hema Malini was with him during meetings and at many interactions in Goverdhan area.Dharmendra promised to return to the region after Hema Malini’s victory and have food at a farmer’s home.Earlier, Hema Malini tweeted: “Today is also a special day for me! Dharamji is here in Mathura to campaign for a whole day on my behalf.”The actress’ campaign has been inspiring jokes and memes galore on social media.Her farm woman avatar, wherein she joined farmers and tried her hand at cutting the wheat crop in this region in Uttar Pradesh, invited not just scorn from the opposition but also the tag of ‘drama girl’ over the ‘dream girl’ she has been known as.Android & IOS users, download our mobile app for faster than ever Bollywood & Box Office updates!